Meridian 59 publisher Near Death Studios announced today that it is shutting down, surprising industry observers around the world who had assumed that Meridian 59 crapped out years ago. 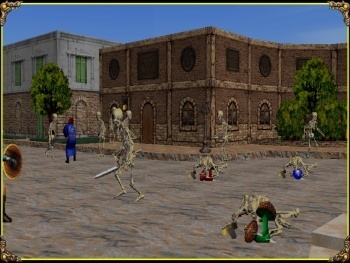 Near Death Studios was founded in 2001 by former Meridian 59 developers Rob Ellis and Brian Green, who bought the rights to the game from original publisher 3DO. Meridian 59 had actually been launched all the way back in 1996, one of the earliest MMOGs to hit the market, but was shut down by 3DO in 2000; Near Death relaunched in the game in 2002. On his personal blog, however, Green wrote that the company has been on "life support" for the past five years and while they were able to keep the game running, there was never enough money to do much else with it. "I haven't taken a regular salary from the company in many years now," he said. "There's enough money to keep the server running and someone to do the minimum maintenance required. But, little work has been done on the game, and believe me the fans have noticed. :)"
The company has faced numerous obstacles over the years but the "killing blow" has a vaguely Al Capone-ish ring to it: The loss of its billing provider. "We no longer had a credit card processor for subscriptions. We talked to another company, but after several months of false starts they told me they were dropping the project since they had sunk so much money into it without result," Green explained. "While deciding how to handle the situation, it was decided that closing down the company was the best option." It's always sad to see a game developer go under, particularly a small one that's struggled for so many years, but I'm not going to pretend that this doesn't have some real comedy potential. A mid-90s MMOG in 2010? "Near Death" Studios? It'd be a shame not to riff on that somehow, but I want to change things up a bit and get some audience participation on this one. Hit me with your best "ba-dum tish!" zinger for this story and don't hold back! Oh, and for anyone who might actually care, Meridian 59 itself isn't going anywhere. "The game will continue running," Green said. "It just won't be running as a commercial concern with Near Death Studios owning it."